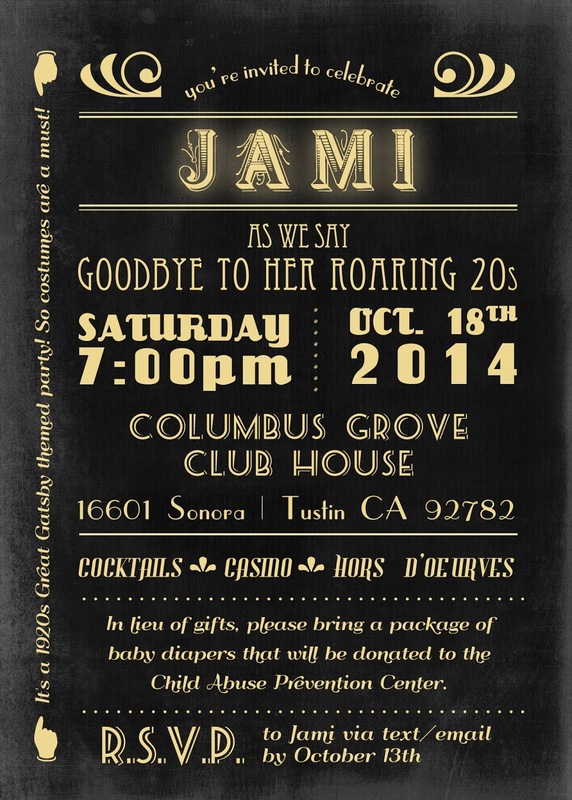 I absolutely loved the invitation for my party as it set the theme perfectly for what was to come. This layout design was purchased from Etsy. 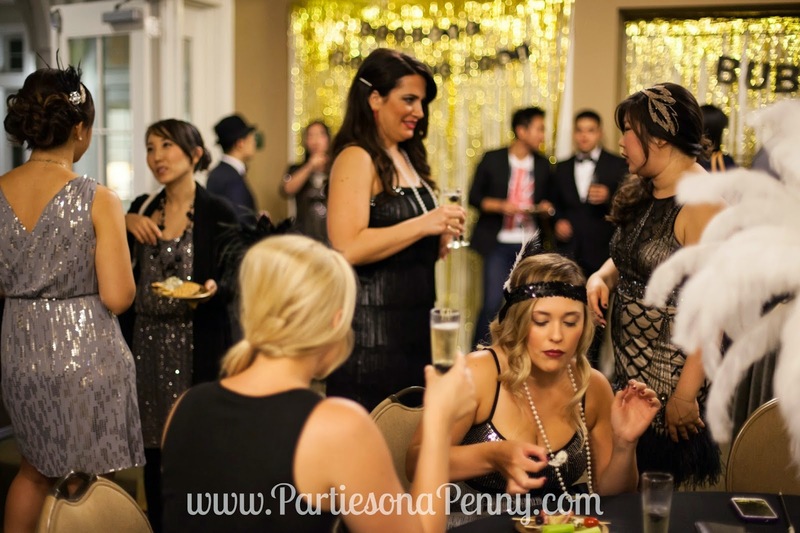 The party was hosted at a clubhouse which was pretty bare, so I brought in a lot of decorations to bring in the 20's flare which meant a lot of feathers, fringe, glitter, gold and black. The bar was decorated with a lot of fringe. 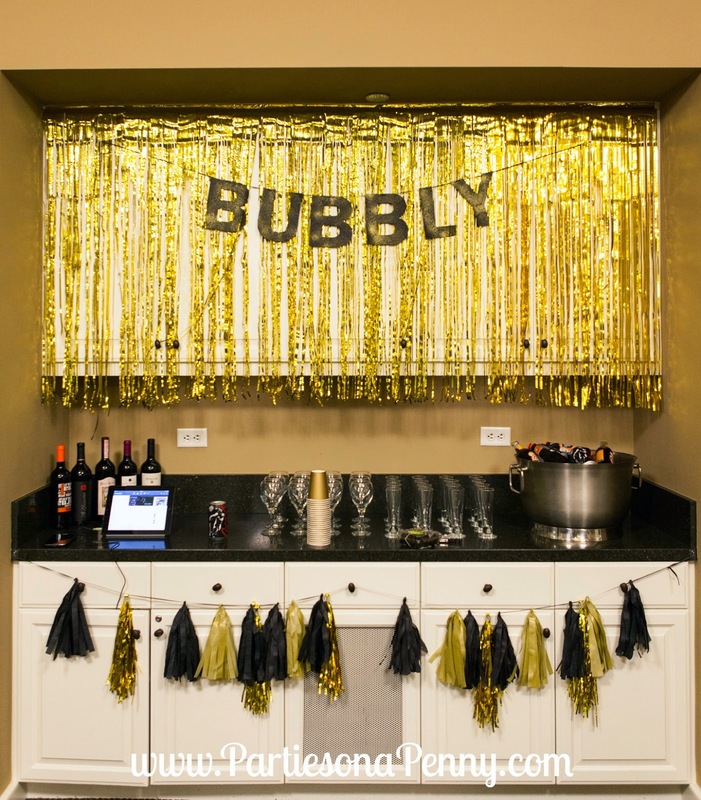 You can find the gold fringe curtain here. 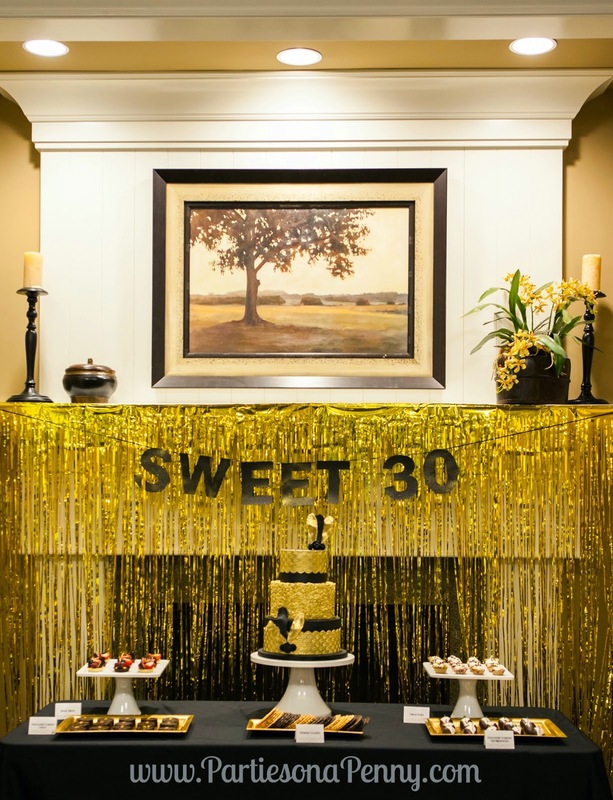 The same gold fringe curtain was used as the photo backdrop for the party. 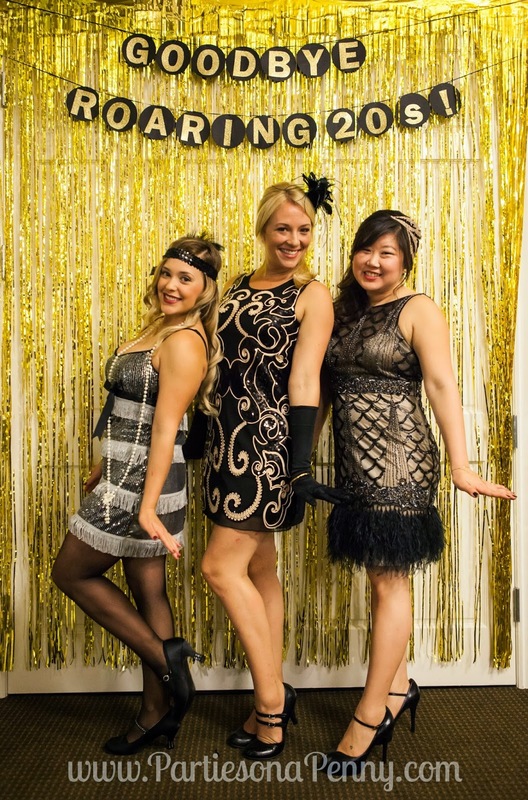 Since it was mandatory for everyone in attendance to dress up in the 20's Gatsby theme, this backdrop was definitely necessary to get some great photo ops. For the centerpieces on the lounge tables, I knew I wanted something dramatic with height. 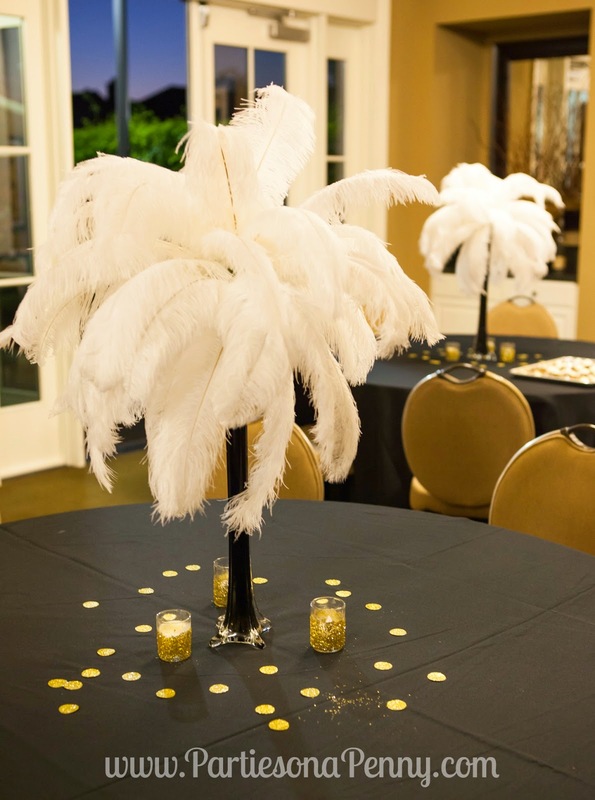 I've seen these feather centerpieces at various events and thought they would be perfect for my party. I purchased the 24" tall Eiffel tower vase at a local event store for $6/ea. For the feathers, I scoured Ebay for weeks to get the best deal on bulk ostrich feathers. Luckily, I was able to get 100 of them for $50, which was a steal. Here is a video tutorial I used on creating these centerpieces (I did not include the lights). 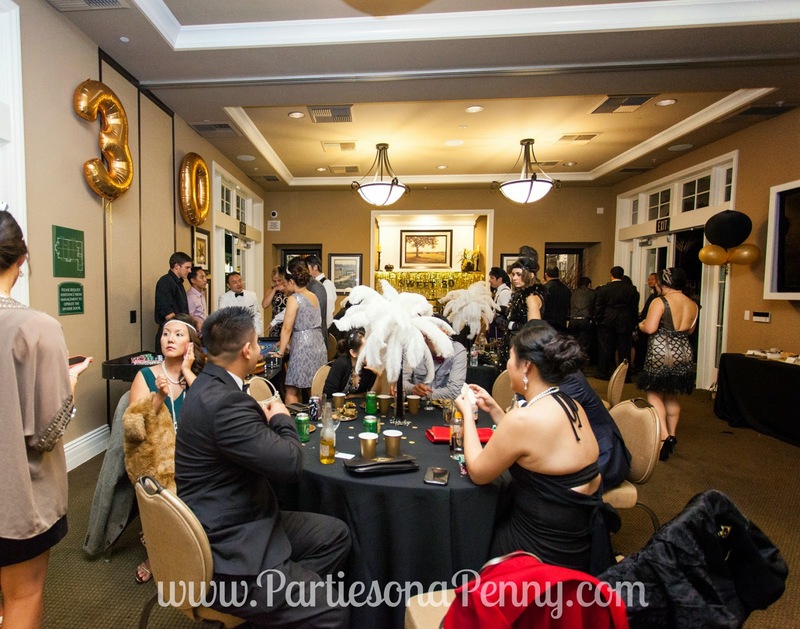 There were also casino tables which took care of some of the decorating of the space. 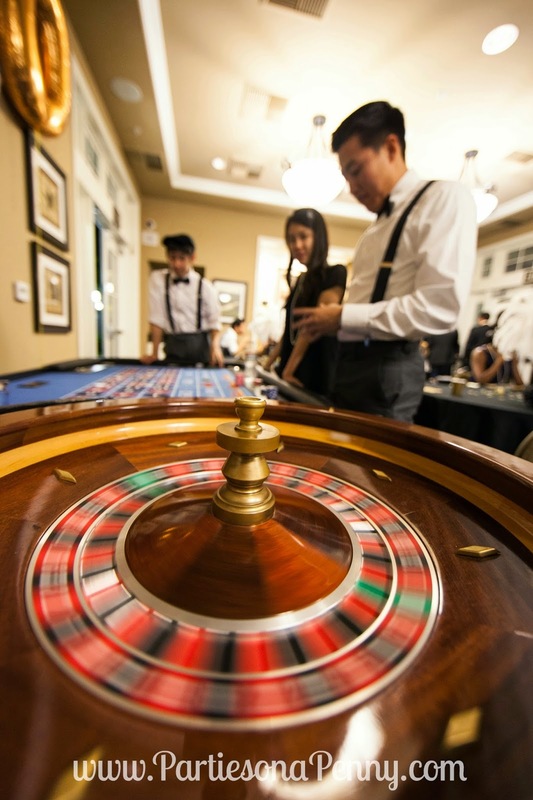 I think it is important to have some sort of activity to keep the party flowing and the poker, blackjack and roulette table definitely kept guests occupied. 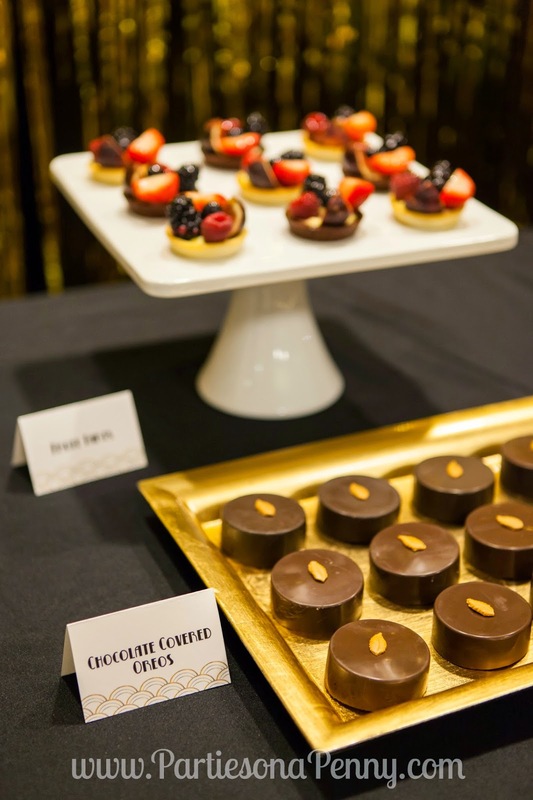 For the catering, I didn't want to drive myself crazy by doing it all myself so I used a caterer for some of the desserts as well as the tray passed appetizers. 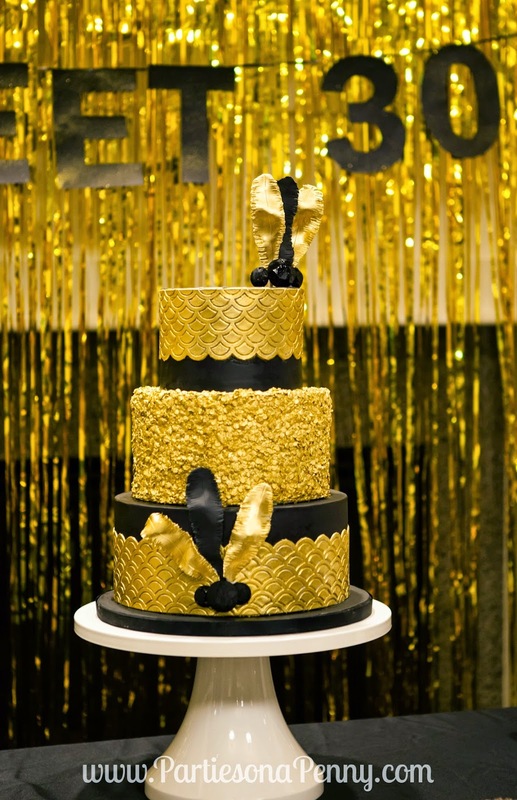 I believe the cake is always the centerpiece of any party and my cake was definitely the center of attention. 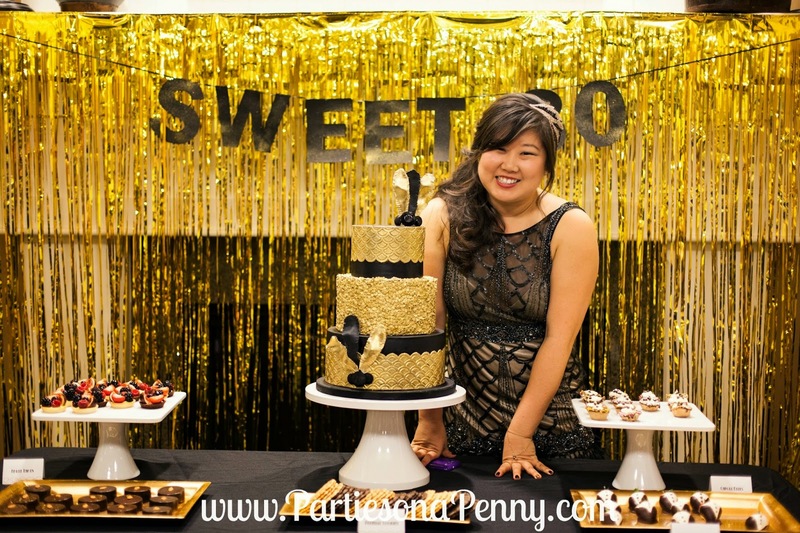 Rooney Girl Bake Shop, a local bakery, created my cake and I absolutely LOVED it! 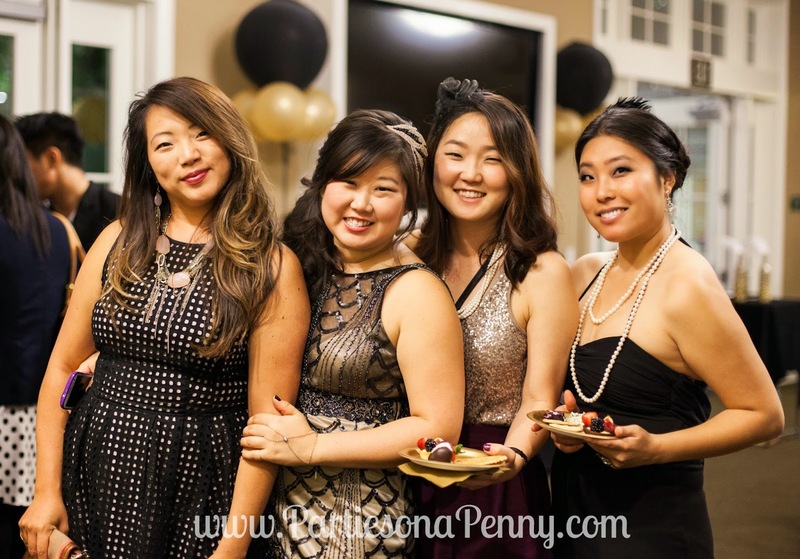 It went perfectly with the theme and colors of the party AND it was delicious! 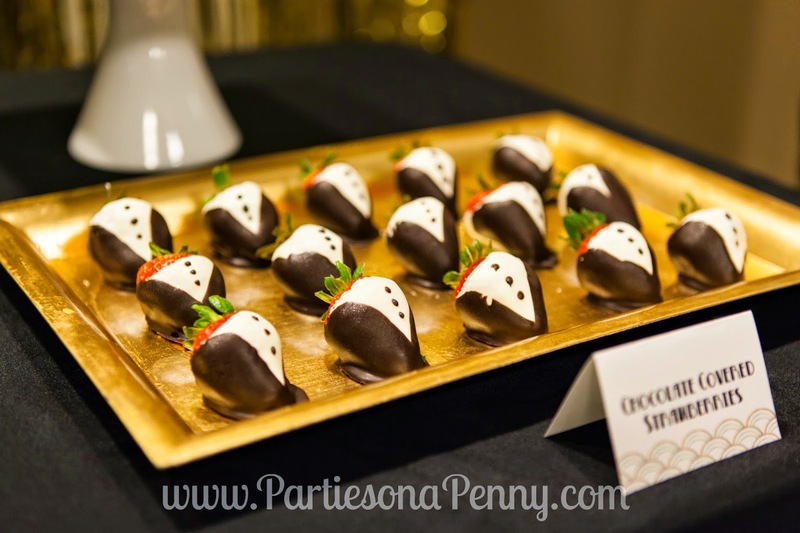 Some of the desserts I personally made for the party were chocolate covered Oreos with chocolate feather accents, tuxedo strawberries and cannoli bites (recipe here) which were all pretty inexpensive to make. 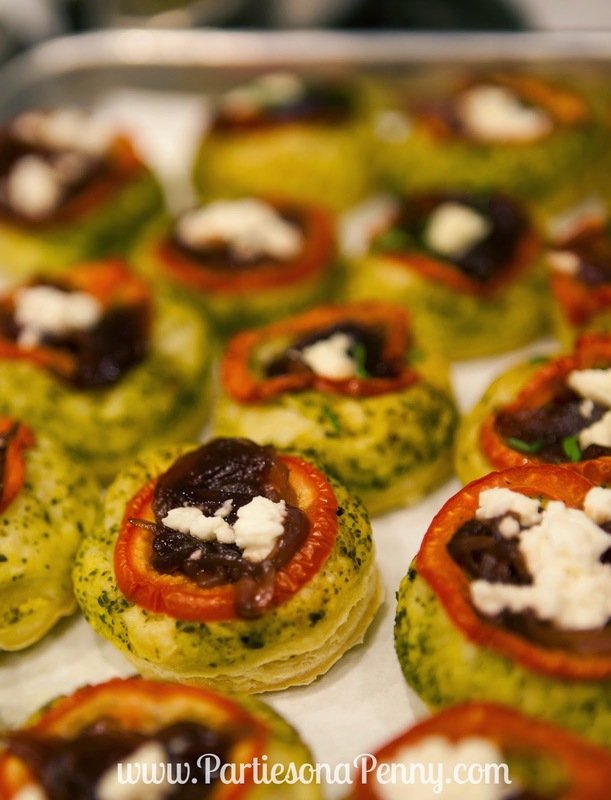 The fruit tarts and pizzelle cookies were purchased from Whole Foods. 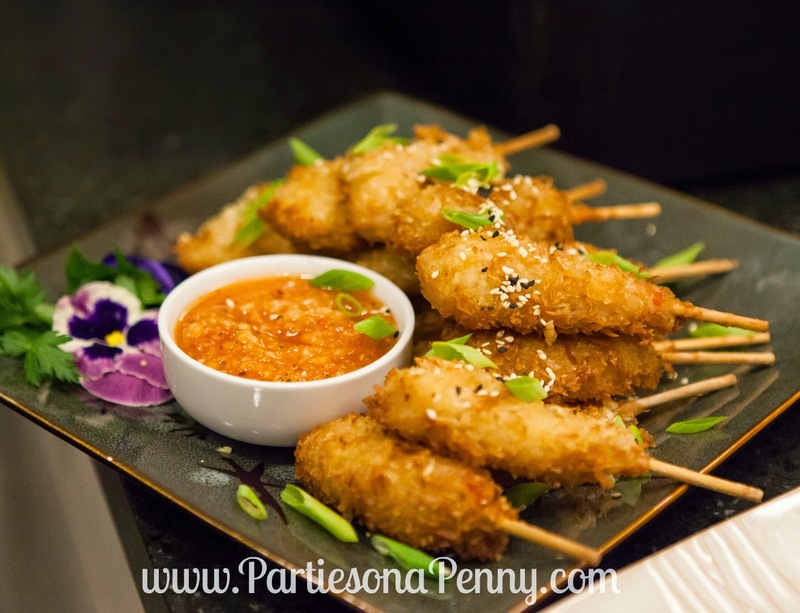 Since I hired a caterer to serve tray passed appetizers, I wanted to provide some additional displayed appetizers to keep people full throughout the party. 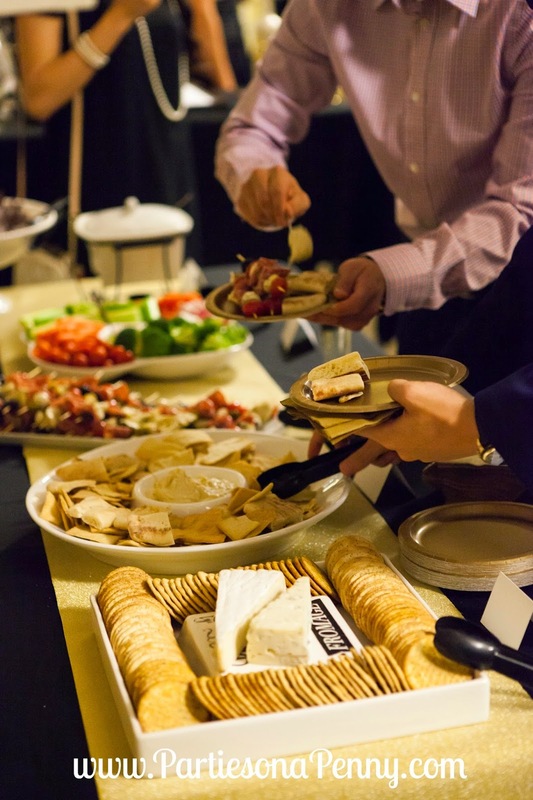 I kept the displayed appetizers simple: a cheese and cracker plate (a must at all my parties), hummus and pita chips/bread, antipasto skewers (recipe here), a veggie plate as well as chips and spinach dip. As a surprise, I brought in a great magician, Jack Velour, to entertain my guests throughout the night. 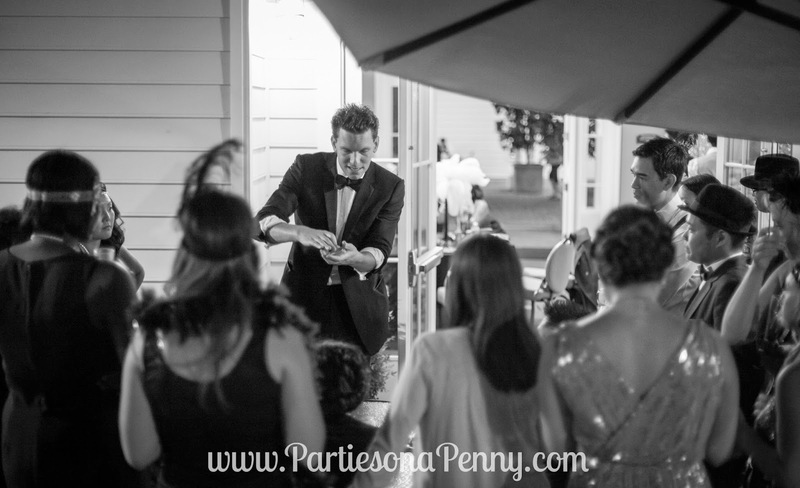 It was great entertainment and all my guests were fascinated with his tricks and sleight of hand. Saying goodbye to my 20's and turning 30 was pretty difficult realization, but I honestly have nothing to complain about. God has blessed me with SOOO much! So here is to turning 30 and entering a new decade! Cheers! 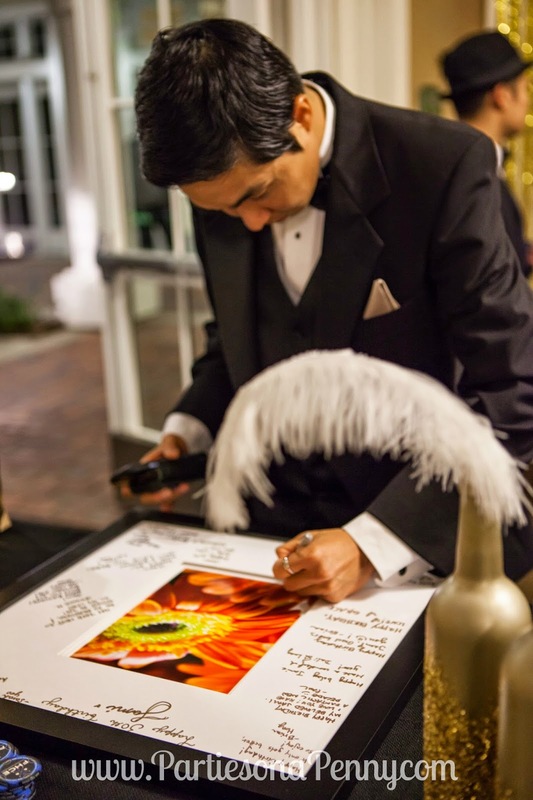 a BIG thank you to Burnt Castle Photography for the amazing photos! Wow looks awesome Jami! Wish we could have made it! I purchased my dress off of Ebay. 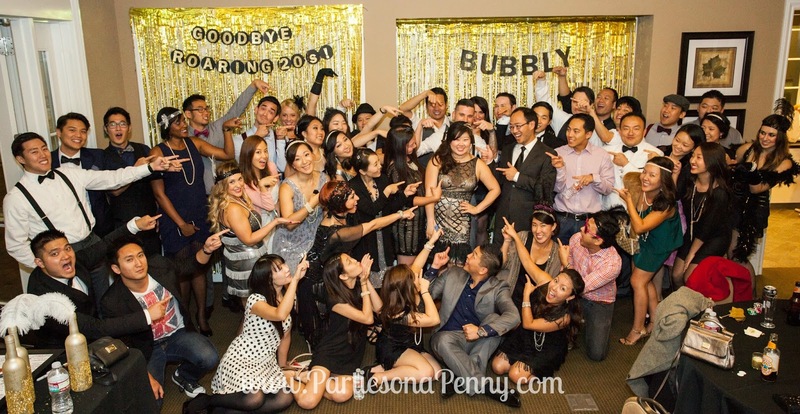 If you search for Sue Wong Gatsby dress you should be able to find it or something similar. Hope this helps! So amazing party. the tower cake is very luxurious. I was jealous to see it.